I bet you weren't aware that most memory foam is made using petroleum. Including those claiming to be "Eco Friendly." The difference is that Essentia uses something called Hevea Milk which comes from the Rubber Tree (Hevea Brasiliensis). The process of collecting the Hevea Milk does not damage the tree and it is made in Canada! From there, it is turned into the natural memory foam that is used in all Essentia mattresses and pillows. You can read a complete review of the Comfort Pillow by Essentia from More Than Mommy. Now that you know how great Essentia is, I'm sure you would love to have some of their products! Not only we giving away a Comfort Pillow (worth $129! 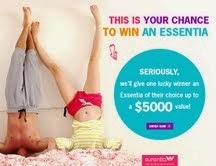 ), Essentia is also offering you a chance to enter their $5,000 Facebook giveaway! To enter the Facebook contest, simply click the link below, and to enter the Comfort Pillow giveaway, you may find entries on the Rafflecopter below! Good luck, everyone! *More Than Mommy received a pillow for review purposes.